Q. What's the fastest way to improve quality of learning, make information more memorable and make your ideas easier to share with others (and probably, get the longest recall)? A: Going Visual, of course. (We're all kids when it comes to learning and visuals/drawings transmit a lot more information in less scribbles than a handful of notes). 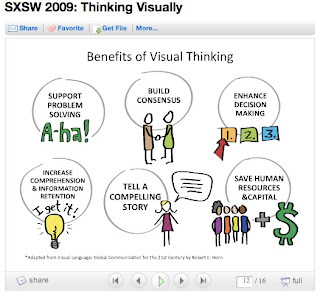 Anyway, if you've got some dough to spare, you may want to check this out and spend for something of value - the Visual Note-Taking 101 course. I know what you're thinking. Even drawing stick figures can be tough for you. So? That is beside the point. But if you're not ready to get your pencils wet? Check out the amazing course authors' blogs and get a glimpse of their amazing work. Austin Kleon - Writer who draws.